New Photos: Where is DWTS Karina Smirnoff Off To? If you head to Getty Images, you can view some new photos of Karina Smirnoff seen at LAX on November 29, 2014 in Los Angeles, California. She looks so cute as always…just as she does below after Thanksgiving with her dog Randy! Private Members Area – Do You Have Questions For Sharna Burgess For A New Interview? Do you have some new questions for Dancing With The Stars pro Sharna Burgess? If so, let us know in comments and Read more..
It’s that time again, Dancettes! Time to make your voice heard for the Dance pros you’d like to see dance on Dancing With The Stars Season 20!! I’m not sure these cast wish posts influence the producers, but, sometimes I have to wonder? 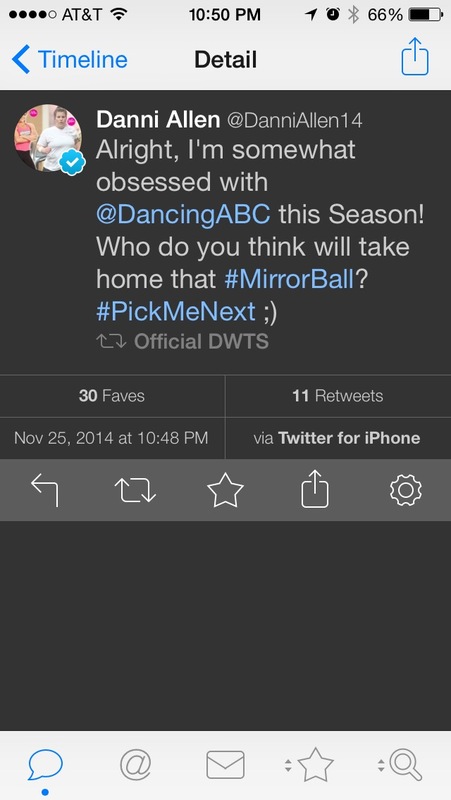 I picked Allison Holker for the past two seasons (as well as several of you) and last season, we got our wish. So, like in seasons past, let’s do it again. What are your pro wishes for Dancing With the Stars Season 20? Pick only 12 (6 males and 6 females). Also, pick FOUR Troupe Members as well. You can also pick a few Alternatives in case they make the cast a little bigger. Let us know your picks in comments and then we’ll send this post to the Producers in a few weeks. Special Note: We plan to do a Celebrity Wish List very soon as well! So stay tuned! DWTS Season 20 Cast Watch Out: The “Biggest Loser’s” Danni Allen To Dance? Thanks to Court’s eagle eye, we have our first rumor of Dancing With The Stars Season 20. Is it possible something might be in the works for Danni Allen of the “Biggest Loser”? Court said she noticed this tweet from Danni on Tuesday night during the finale. At first, she didn’t really think much on it being it was campaigning (which we don’t always post about), but, then @DancingABC retweeted it. Interesting, hmmm? Let’s keep our eye on this one. Note too that according to her twitter, she’s got her eye on Val Chmerkovskiy. Will Allison Holker Be back For Dancing With The Stars Season 20? And the fun continues! Happy Thanksgiving, All!!! It’s such a surreal feeling to stand out on the ‘Dancing with the Stars’ dance floor with so many watching — so last night just moments before the show started, I stood on that dance floor and closed my eyes and just listened to the audience screaming and cheering for the show and everything that it brings — which is happiness, hope, and a chance to do something you didn’t think you could do. “DWTS” brings joy and entertainment right into people’s homes, and I am honored to be a part. ‎Thank you to everyone in the “DWTS” family. You’re truly the best. Season 19 was perfect, and I’m proud of all the work we put out, and congrats to Alfonso and Witney on winning the mirror ball trophy! What’s next? Well, next season is “DWTS” 10th anniversary! And that will be a celebration you won’t want to miss. See you soon. More at In Touch Weekly including some pictures of her and tWitch. More interviews All! Check out E Online as they’ve posted some new interviews with the finalists. Also, below are the finalists talking with with George Pennacchio and ABC7. ETA: Scroll Below for updates!! ETA: How about some ET Online and People coverage? Read more..